Waverley Brownall have specialised in the machining of exotic alloys for over 40 years. In the early years we acquired an enviable reputation for producing precision components from pure Molybdenum, Tungsten and Monel in addition to our base product material of 316 stainless steel. In those days cutting tools were very basic and the machines were all manually controlled. These days we benefit from vastly improved cutting tools and incredibly accurate machines controlled by computers. The materials have also increased in their scope and complexity. 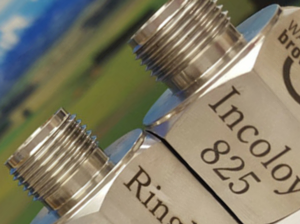 We are now specialists in producing a huge range of valves and pipe line components in all the high nickel chromium alloys plus the Duplex stainless steels and Titanium. The most commonly specified material for use in the manufacture of corrosion resistant high pressure valves and fittings is 316 stainless steel. It is easy to machine, cast and forge, and is readily available as raw material in a wide range of shapes and sizes. Waverley Brownall stock 316 stainless steel valves and fittings and its product range extends to over 2000 different items. We also hold considerable stocks of 316 stainless steel raw material. 6MO is a 6% molybdenum alloyed austenitic stainless steel. The increased molybdenum content, up to 6% from the 2% as found in 316 stainless steel, plus the increase in chromium and added nitrogen provides 6MO with some worthwhile benefits over 316 stainless. Its corrosion resistance is increased particularly with regard to pitting and crevice corrosion. The strength of 6MO is also slightly increased above that of 316 stainless. 6MO is readily available as raw material in most shapes and sizes and is not a problem to machine. Valves and fittings will generally cost about 3 times the price of a 316 stainless steel equivalent, which will be a lot lower than the nickel based alloys. Waverley Brownall hold moderate stocks of a wide range of fittings in 6MO and raw material to make anything to order. Introduced an 1905 Monel was the pioneer of the nickel based alloys offering high strength and good corrosion resistance. Its toughness and good wear properties made it very popular with pump and valve manufacturers. Although over shadowed somewhat by the modern nickel iron chromium alloys and the high nickel chromium alloys, Monel is still an excellent choice where atmospheric corrosion is an issue, particularly sea water. Monel is readily available as raw material in most shapes and sizes and, although tough, it is not that difficult to machine. Valves and fittings will cost about 4 times the price of a 316 stainless equivalent. Waverley Brownall hold moderate stocks of a wide range of fittings in Monel and stocks of raw materials to make customers’ orders. These materials are a natural step up from normal stainless steels and 6MO stainless. Their structure is an amalgamation in equal parts of austenite and ferrite. As a result these high chromium alloys have a higher tensile strength and good corrosion resistance. The super duplex alloy has excellent atmospheric corrosion resistance and finds many uses in aggressive and seawater environments. It is particularly beneficial in resisting stress corrosion cracking which is a common problem with austenitic stainless steels. Although generally specified for use in structures and fabrication work, it is often used for pipe line components. The duplex stainless steels can be obtained as raw material in a range of sizes but not always in a large variety of shapes: ie: hex bar. Because of its high Chromium content it can be particularly hard to machine and combined with the high raw material cost the price of fittings will be 8.5 times the price of a 316 stainless steel equivalent. Waverley Brownall hold very limited stocks of finished components and raw materials in duplex, but we can generally quote deliveries of less than 8 weeks for most of our product range in duplex. Sometimes described as a super austenitic stainless steel, 825 is a long service forerunner of the nickel iron chromium alloys. With the addition of molybdenum, copper and titanium, this alloy will give excellent corrosion resistance to a broad base of severe environments. It has good resistance to stress corrosion cracking and the high nickel content in conjunction with the copper and molybdenum gives it outstanding resistance to reducing environments such as those containing sulphuric and phosphoric acids. The alloys chromium content confers resistance to a variety of oxidising substances such as nitric acid, and the molybdenum also aids resistance to pitting and crevice corrosion. The alloy will also retain its strength from cryogenic temperatures up to 400 oC and higher. It is used extensively in the chemical processing industry but because of its excellent resistance to corrosive environments, including in particular, seawater, it has become an excellent material for the offshore industry. The only slight downside is its relative high (22%) iron content which makes it less resistant to alkalis. Incoloy 825 is readily available as raw material in most shapes and sizes and is not a problem to machine which makes it generally less expensive to use than the high nickel Chromium alloys. Valves and fittings will cost approximately 7.0 times the cost of the equivalent item in 316 stainless steel. Incoloy 825 may not be the ultimate choice when faced with severe corrosive environments, but taking into account its cost and availability, it is certainly a prince among corrosive resistant alloys. Waverley Brownall hold stock of the more popular size fittings and moderate stocks of raw material in the form of bar and forgings. This is one of several high nickel chromium alloys of particular mention because of its combination of very high strength, excellent fabricability, and outstanding corrosion resistance. It also has a particularly useful temperature range from cryogenic to 950 oC. Its strength is derived from the effects of the molybdenum and niobium on its nickel chromium structure. This combination of elements are also responsible for its superior resistance to a wide range of corrosive environments of unusual severity. These properties have made it an excellent choice for sea-water applications such as wire rope mooring cables and propeller blades for Naval vessels. Its thermal fatigue strength, oxidation resistance and excellent weld ability have made this alloy of interest for a variety of aerospace applications. Its high corrosion resistance and fabricability have also made it a favourite with the chemical industry for its plant and storage equipment. Inconel 625 will almost resist complete attack from sea-water, neutral salts and alkaline media, and will also resist such corrosive problems as hydrochloric and nitric acids. Because of the high nickel (up to 60%) and chromium content of 625 it is hard to machine, and like all the high nickel chromium alloys the raw material is very expensive. Valves and fittings will cost approximately 9.0 times the cost of the equivalent item in 316 stainless steel. Since it is not normally specified for valves and pipe components (C276 is similar in price and makes superior fittings) Waverley Brownall hold very limited stocks of finished components and raw material. We can generally, however, quote deliveries of less than 8 weeks for most of our product range in Inconel 625. The material is also sold under other names including Inconel C276. Hastelloy C276 is well known for its outstanding corrosion resistance in a wide range of extremely aggressive media and very punishing environments. It is truly a superalloy amongst the high nickel-chromium-molybdenum materials, and is considered the preeminent alloy for the chemical industry. It resists many of the most severe media encountered in chemical processing, including reducing and oxidizing acids. It has exceptional resistance to sulphuric acid and hydrochloric acid, plus excellent resistance to phosphoric acid. The controlled amount of tungsten and very high content of molybdenum :(up to 17%) C276 has excellent resistance to stress corrosion cracking, and pitting. Alloy C276 is also almost unmatched in its resistance to seawater especially under crevice conditions which would induce attack in other commonly used materials such as 316 stainless steel, 6MO stainless and monel. Hastelloy C276 is also favoured by the oil and gas industry because of its ability to handle “sour”( natural) gas, combined with its corrosive resistance by seawater. In such environments it has become very popular in the manufacturer of valves and pumps. Because of the alloys high chromium and nickel content, plus the addition of tungsten and cobalt. C276 is very hard to machine, and the raw material is expensive. Hastelloy makes surprisingly good compression fittings and valves but they will cost at least 9.0 times the price of the equivalent item in 316 stainless steel. Waverley Brownall hold stock of the more popular size fittings and moderate stocks of raw material in the form of bar and forgings. Titanium is truly an amazing material, which boasts a magnificent array of diverse applications. It gives rubies their starry shine and forms alloys as hard as sapphire, and in its brief lifetime (pure metallic titanium was not produced until 1910) it has affected and infiltrated our everyday lives in so many ways, and at a rate which will continue to grow. Only 5% of all titanium extracted is refined into metal, the remaining 95% appears in dozens of products in daily use such as toothpaste, paint, paper, sporting goods and mobile phones. 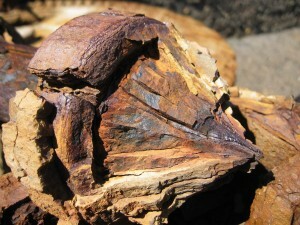 Upon exposure to air, titanium immediately forms a passive oxide coating which protects the bulk metal from further oxidation. This protective layer renders titanium immune from attack by most acids and chlorine solutions. Since titanium depends for its corrosion resistance on the presence of an oxide film it follows that it is significantly more resistant to attack in oxidising solutions. The chart in the attached appendix therefore, does not recommend titanium for use with hydrochloric acid and possibly sulphuric acid. This , however would only be the case when it was a high concentrated solution and if there are no oxidising agents present. Titanium can withstand attack surprisingly well from diluted solutions of these reducing acids and is also one of the few metals which can resist corrosion from aqua regia acid which is capable of dissolving the noble metals . Titanium has exceptional corrosion resistance in seawater and chloride solutions even in high-flow velocities, which makes it the material of choice for desalination plants. It also has particularly good resistance to pitting and crevice corrosion, but stress corrosion cracking can occur in certain environments, although, these are extremely limited. Apart from titanium’s excellent corrosion resistance it is probably best recognized for its strength to weight ratio which is the highest of any metal. This makes it a very attractive material for the aerospace industry where both strength and weight play a critical role .More recently these attributes have been successfully adopted in the construction of all formula one racing cars, even being combined with carbon fibre to give this material added physical advantages. Another very important application of titanium which has improved so many people’s lives is for load-bearing orthopaedic implants on account of its inherent biocompatibility. Titanium has a well-matched Young’s modulus with bone, and so skeletal loads are distributed equally between the host bone and the implant. Titanium has a high melting point of 1725 oC and a very useful temperature range from cryogenic to 850 oC without loss of strength. Titanium is readily available as bar and although expensive it is not as costly as the high nickel chromium alloys such as Inconel 625 and C-276. Although not a particularly hard material, great care must be taken when machining Titanium, since if it becomes too hot it will soften and retain a tendency to gall when assembled, it also has a fairly high surface wear rate. In fact Titanium has a natural affinity with itself (it binds together) on assembly when any pressure is exerted. It, therefore, does not easily render itself to the manufacture of high pressure tube fittings. 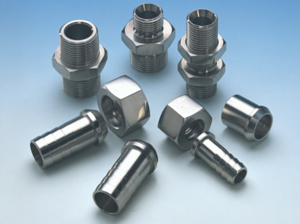 If however, the correct skills and techniques are used, titanium tube fittings can be successfully produced, which then present the user with an interesting array of benefits. When in the future the raw material costs have been reduced with the introduction of new refining technology, titanium could replace 6MO, Monel and even 316 Stainless Steel as the first choice for instrumentation products. Even the expensive high nickel chromium alloys may seem less attractive when faced with titanium’s outstanding all-round corrosion resistance. With the current cost of titanium raw material, valves and fittings will cost approximately 5.0 times the price of the 316 Stainless Steeel equivalent. Waverley Brownall hold modest stocks of both finished products and raw material and prefer to manufacture to order with deliveries of no more than 6 weeks for most items. When selecting a material for the manufacture of high pressure valves and fittings, since 316 stainless steel provides sufficient strength the only remaining criteria for selection is corrosion resistance and operating temperature. There are many variables which influence the performance of a specific material in a specific environment. These include concentration, temperature, aeration, liquid or gaseous flow rates, impurities and cycling process conditions. While every attempt has been made to present a broad base of information, more detailed data will often be needed for individual applications and environments. Acids can be either oxidizing or reducing in nature. 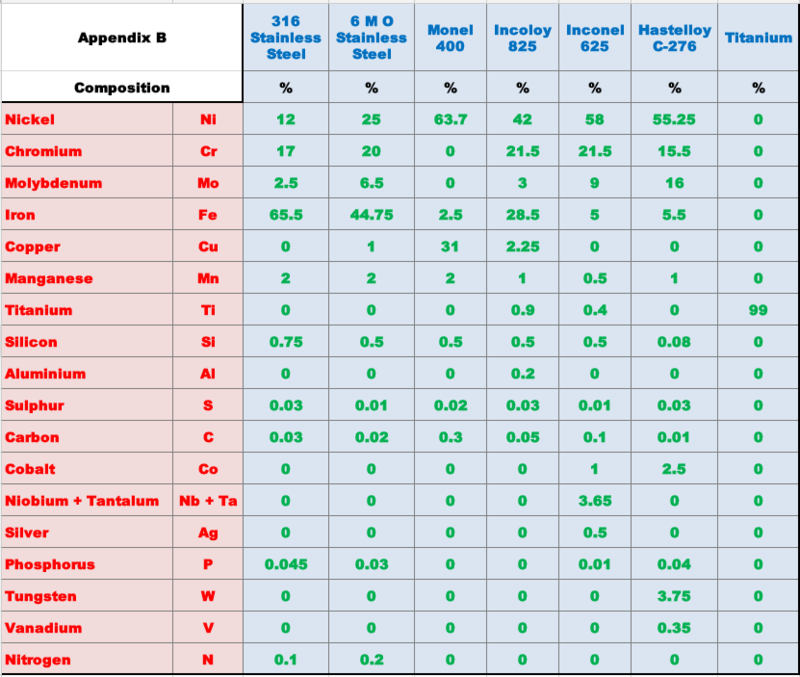 Some metals are resistant to oxidising acids (eg nitric) while others are resistant to reducing acids (eg hydrochloric or sulphuric), even titanium and hastelloy have preferences. As mentioned above the choice of a metal for a specific environment will depend, on a great many variables in addition to the acid or mixture of acids present. The metal selection considerations for just a sample of the more important acids are outlined below. Sulphuric acid is often encountered in industrial environments because it is used extensively in a variety of chemical processes. The selection of a metal for a particular sulphuric acid process depends on a great many factors such as the concentration of the acid, its temperature and aeration apart from the inclusion of any other media. So whereas monel 400 is useful for handling diluted sulphuric acid, at concentrations greater than 65% and at elevated temperatures monel’s corrosion rate undergoes a sharp increase. 6MO stainless steel with its high chromium content and added molybdenum has a useful resistance to corrosion in sulphuric acid when the concentration is higher than 65%, but at moderate temperatures. For excellent resistance to sulphuric acid at intermediate to high concentrations and with improved resistance at higher temperatures the choice has got to be incoloy 825. This alloy offers good general resistance to sulphuric acid even when chlorides are present. In applications where the exposure is continuously submerged in chloride contaminated media particularly when the sulphuric acid concentration is above 65% at high temperatures then the higher molybdenum alloys such as Inconel 625 or even hastelloy C-276 may be required. Titanium can cope very well against corrosion from diluted sulphuric acid and has excellent resistance if there are any oxidising agents present. 316 stainless steel is also very capable of resisting attack from dilute sulphuric acid. Above a 15% concentration and at anything higher than room temperature monel 400 does not like hydrochloric acid. The most commonly used alloys in processes containing dilute hydrochloric acid are 6MO stainless steel and incoloy 825. Resistance is improved with the addition of copper and the higher nickel content of incoloy 825. Inconel 625 with its even higher nickel and molybdenum content has very good resistance to dilute hydrochloric acid, but for really aggressive hot solutions, then hastelloy C-276 is the best choice. 316 stainless steel and even titanium would not be recommended for use with hydrochloric acid. 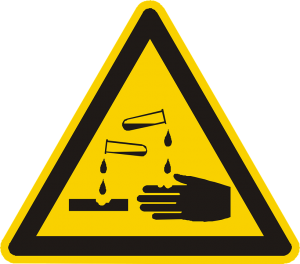 Few compounds are more corrosive than hydrofluoric acid. Only gold and platinum are completely resistant to attack in aqueous solutions. Although incoloy 825 is occasionally used because of its high resistance to stress-corrosion cracking, this alloy along with inconel 625 and hastelloy C-276 offer no improved corrosion resistance to hydrofluoric acid than monel 400. Monel 400 is an outstanding material for service with hydrofluoric acid in all concentrations up to boiling point; there is no better choice. Pure phosphoric acid has no effective oxidising power and is classified as a non-oxidising acid, much like dilute sulphuric. Commercial phosphoric acid, however, usually contains impurities such as fluorides and chlorides that markedly increase its corrosiveness. Although 316 stainless steel is an acceptable material for use with phosphoric acid, 6MO stainless steel will provide superior resistance to attack from pure phosphoric acid. By far the most suitable metal, however, for service with phosphoric acid is incoloy 825. It has excellent resistance to pure phosphoric acid at all concentrations and temperatures up to and including boiling 85% acid, and although Inconel 625 and hastelloy C-276 also offer excellent resistance to phosphoric acid they are no better than incoloy 825. Only when there is the presence of appreciable amounts of chlorides and fluorides would the additional elements of 625 and C-276 provide superior resistance. Titanium offers reasonable resistance to phosphoric acid, but would not normally be chosen in preference to incoloy 825 which is the most suitable choice. Nitric acid is strongly oxidising and, because of this, metals with the best resistance are those that form passive oxide films, and have significant chromium content. Monel 400 would definitely not be recommended and is rapidly attacked by even very dilute nitric acid. 316 stainless steel offers good resistance to attack and 6MO stainless steel with its higher chromium content can provide even greater protection. Incoloy 825 has excellent resistance to nitric acid solutions at all concentrations and temperatures up to and including boiling 65%. Inconel 625 also has good resistance to nitric acid, but offers no beneficial improvement in resistance to that of incoloy 825 unless there are other acids present. With its lower chromium content hastelloy C-276 would not be recommended for service with nitric acid. Titanium, with its strong oxide film when exposed to any oxidising environment has excellent corrosion resistance to nitric acid even when other acids are present. 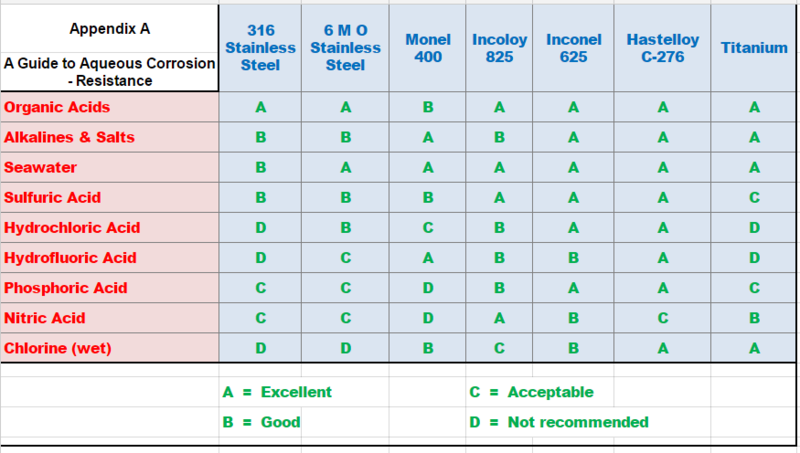 Although 316 stainless steel has good corrosion resistance to alkalis and salts because alkalis tend to cause corrosion by localised attack resulting in pitting and crevice corrosion the higher molybdenum content of 6MO stainless steel would provide superior protection. 6MO stainless steel would also provide as good a service in alkalis and salts as incoloy 825 making the selection of incoloy 825 pointless. If improved corrosion resistance is required then monel 400 has excellent resistance to corrosion in alkalis and salts through most concentrations. Only in strong alkalis at elevated temperatures would monel 400 be subject to stress-corrosion cracking. While inconel 625 and hastelloy C-276 offer excellent corrosion resistance these alloys are not normally required. Titanium is also outstanding at resisting corrosive attack from alkalis and salts, but suffers from its normal disadvantage of severe galling with the assembly of pipe line components. If stress-corrosive cracking is likely to be a problem then the higher nickel based alloys offer the best solutions and in the case of acid chlorides, hastelloy C-276 will show the highest resistance, followed by inconel 625, monel 400 then 6MO stainless steel, and incoloy 825 down to 316 stainless steel. It almost goes without saying that there are a myriad of variables which will influence the corrosion characteristics of an atmosphere. Diverse factors to name but a few would include humidity, temperature, sulphur dioxide content, chloride content, rainfall and dust. 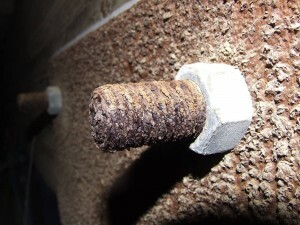 Even the orientation of the exposed metal can have a marked effect on corrosion behaviour. It is common practice to classify atmospheres into three main categories, e.g rural, industrial and marine. You could sub-divide these even further into wet or dry areas etc, but the three main divisions are generally adequate. In an industrial atmosphere, the burning of fossil fuels will generate large amounts of sulphur dioxide. All of the alloys discussed here will normally cope quite well with most industrial atmospheres, and if conditions are particularly severe, then one would not normally need to specify anything more than 6MO or incoloy 825. 316 stainless steel will adequately cope with almost any rural atmosphere, and the marine class of atmospheres which can present the biggest challenge to a metals corrosive resistance is covered in the next section on corrosion by waters. The attack of metals by waters has received an enormous amount of research and the books and papers on the subject, particularly if one also includes biofouling, is too numerous to mention. What is being covered here is a brief overview of the main areas of corrosion attack by waters which would be encountered by precision valves and fittings manufactured from the materials so far discussed. It is probably easiest to divide potentially corrosive water into three main classifications; namely distilled and high purity water, fresh waters (e.g tap water) and seawater. All the metals discussed here will show excellent resistance to corrosion by fresh and distilled water and in the case of inconel 625, hastelloy C-276 and titanium the corrosion rates would essentially be zero. Often the main form of attack in water affecting valves and fittings would be from pitting or crevice corrosion. If pitting and crevice corrosion was a problem due to contaminated bearing water then 316 stainless steel may need to be replaced by the higher molybdenum-bearing metals of 6MO stainless steel or incoloy 825. The high nickel based alloys containing molybdenum, such as inconel 625 also have very good resistance to the effects of biofouling. 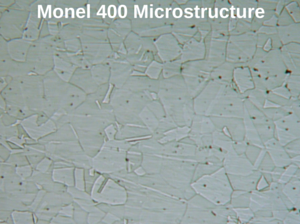 Monel 400 generally has excellent corrosive resistance to distilled and fresh waters. Only if oxidizing salts (mine water) are present will monel 400 suffer. Seawater is clearly the most corrosive of our three main classifications. In fact seawater is one of the most corrosive and certainly the most abundant naturally occurring corrosive media on the planet; or perhaps more correctly described as a corroded electrolyte. Other factors which can have a major effect on corrosion rates particularly in the submerged zone are oxygen levels, biofouling, pollution, temperature, salinity, and velocity. Interestingly, from a corrosion point of view, the seawater behaves differently under the aforementioned conditions. Pitting and crevice corrosion are the most usual mode of attack for stainless steels in the fully immersed zone. The corrosion rate, therefore, in fully submerged seawater will be a function of the chromium and nickel content plus the presence of other alloying elements such as molybdenum. To emphasis the other factors at work it is interesting to note that the corrosion rate of 316 stainless steel is much higher when partially immersed; i.e: the splash zone than when fully submerged. This is due to the higher oxygen concentration which increases the pitting process. Due to the higher chromium and nickel content of 6MO stainless steel and incoloy 825 they are far less affected above the water level and show an increase in the rate of corrosion when fully submerged. Monel 400 has very good resistance to corrosion in flowing seawater but can suffer an increase in the rate of corrosion in stagnant or slow moving seawater. 6MO stainless steel and incoloy 825 offer very good alround corrosion resistance to seawater, although, incoloy 825 can be susceptible to biofouling. 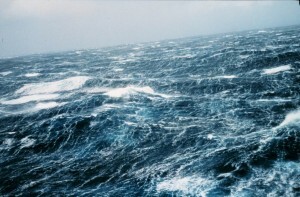 In both flowing and stagnant conditions Inconel 625 and hastelloy C-276 provide excellent corrosion resistance to seawater. Titanium with its very strong oxide film stands alone in having outstanding resistance to attack from seawater under any conditions of exposure. If titanium’s problem of adhesion and galling upon assembly could be easily overcome then this metal in the future would offer unbeatable service for any seawater application.